She tells us, “My main focus now is faux fur Pom poms and indie dyed yarn.” Currently, she is into making Pom Poms, those cute and soft beauties, for all us – crafters, crocheters and knitters. We all love those pom poms for the beanies that we make right?! Her First Sale story is very relatable to the quote – “Invention is the mother of necessity.” Her Pom Poms got sold in 2017 after she moved to Virginia. She excitedly adds “I decided to make Pom Poms for my beanies and posted them on my Instagram. People loved them so I decided to offer them for sale in my shop. The rest is history.” Just trying to make and invent something for herself, turned out to be a business and a living for her today. Like all the good husbands Lindsay’s husband is also very supportive of her business, in fact, he motivated her to start and learn yarn dyeing too. That is so awesome. It is really good to hear stories like these where the better half understands the passion and helps us grow the business. Oh and one great thing that makes her business different from the other Pom Pom makers is that she has about 45 different colors to chose from and more to come. Isn’t that great??? So many colors for all our beautiful beanies. A person must cultivate some hobbies to relax and rejuvenate and Lindsay does exactly that by listening to Music most of the times. And like all of us – she loves to just sit on her deck and drink a good cup of coffee. When we asked if she wants to give any word of advice to all us crafters she very beautifully emphasizes on how one should focus on one’s own work and not to look and compare with other peoples’ work. All in all a beautiful lady, doing a lovely business which will definitely help the business of many crocheters and knitters and add some colors to everyone’s lives. So who wants some beautiful Faux Fur Pom Poms and Dyed yarn? You know where to go right?! 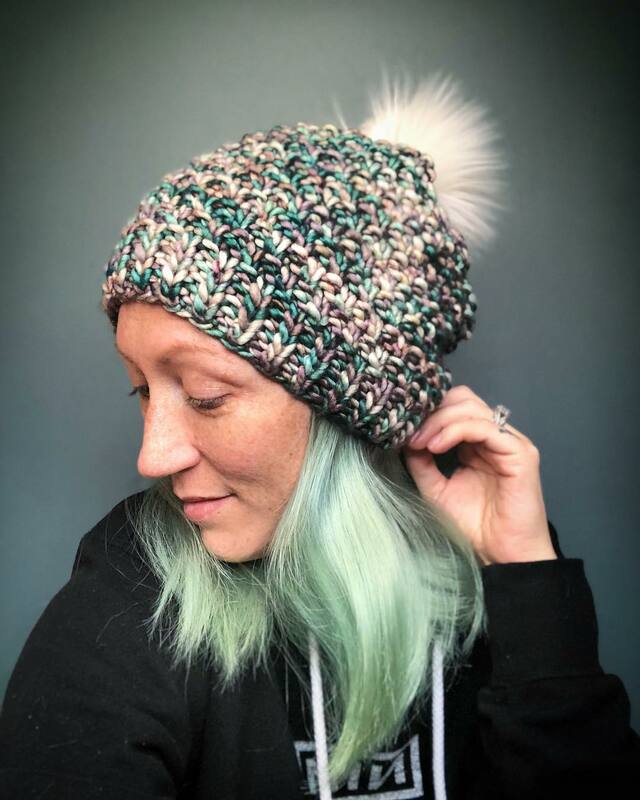 Connect with ThreadHead Knits Co.
Love our Lindsay and her awesome better half! They are awesome people!!! Her pom poms are so so soft!